If your book was turned into a movie, who would you like to see play your characters? Authors are often asked that question. Aah… if only! It would be so much fun to see my imagined characters come to life on screen—especially the dogs! Best-selling author Jane Porter doesn’t have to dream about an imaginary cast. A few years back, her women’s fiction novel Flirting with Forty was made into a Lifetime Original movie starring Heather Locklear and Robert Buckley. Flirting with Forty the movie closely follows Jane’s book—a coming-of-middle age story of a woman not ready to give up on love and life. Following a nasty divorce, on-the-cusp-of-forty Jackie Laurens goes on vacation to Hawaii. Her passionate fling with her much younger surfing instructor Kai (Kyle in the movie) leads her to question what she will risk for happiness. I can only imagine how exciting it must have been for Jane to watch the movie being filmed on location in Hawaii. Especially as Jane makes no secret that Flirting with Forty is based on her real-life love story with Ty Gurney. When Flirting with Forty first aired in the US in 2008, it was watched by more than four million viewers, making it one of Lifetime Television’s four most-watched movies of 2008. Jane writes women’s fiction for 5 Spot/Hachette and passionate contemporary romance for Harlequin. I’ve met her in both the US and Australia where she has many fans. She’s a warm, generous person and a truly inspiring speaker—I’ve seen audiences moved to tears as she talks about how she creates the memorable characters who people her books. I’m a fan of both Jane and Heather Locklear and I can’t wait to see the movie! 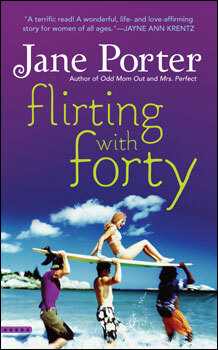 Visit Jane Porter’s website to read more about Flirting with Forty.